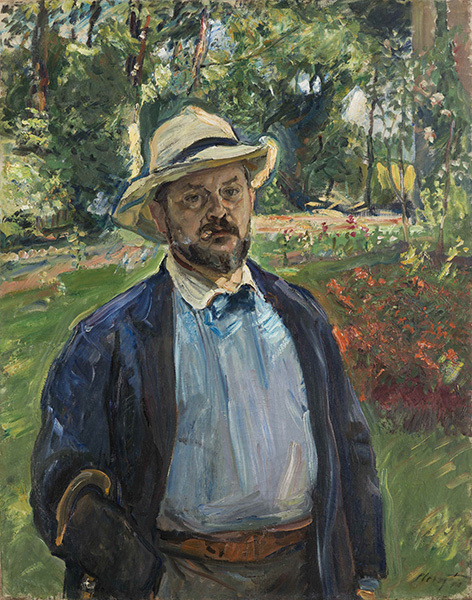 Max Slevogt was a highly successful artist in Berlin when he depicted himself here, at the age of 41, in the garden of his in-laws' estate, 400 miles west of the German capital. His combination of portraiture and landscape in a single painting reflects his fame in both domains. Like his Impressionist counterparts in France, Slevogt imitates the blurring effects of long-exposure photography (the smoke of his cigar, the foliage in the background), and captures the flickering play of light. Otherwise his approach differs considerably from the French Impressionists. His work has a sculptural quality where his French counterparts present their subject through a veil of unified color. The French masters achieve visual vibrancy through complementary color values and different hues of the same tone, while Slevogt relies on virtuoso brushwork, often accentuated by thickly built-up paintâ€”quite unlike the systematic brushstrokes of the French.